Juarez, a middle-aged man of Latino descent, was new to court and fresh in his position, though not, she read, new to both battle and politics. It was the slight scar on his face and the calluses in his handshake that told her the former; his silver tongue, the latter. He was good looking… at one time, she would have immediately thought of her old boyfriend… but that was years ago, of course. Though he did look a little like an actor she had seen in an old American movie from back in the early 21st century… Woops, he was talking. ‘Wake up, Jupiter!’ she mentally slapped herself into a response after two or three seconds of sticky silence. “Thank you for your consideration, Administer,” she nodded her head, both in appreciation and in dismissal. He smiled brilliantly and bowed before turning, his court half-cape whirling dreamily as he exited the assembly room’s doors. She knew what Venus would be saying right now… and doing: Suggestive looks, doe-eyes and winking – Scout of Love? More like scout of prodding-people-towards-relationships-for-the-sake-of-amusement! Jupiter smiled, remembering a conversation not long ago when Mars accused a meddling Venus of being more an Eros than an Aphrodite. … Though it would be nice to have a little romance… Venus did seem so happy with that Northern Europe representative – Frey, was it? That tall, fair skinned blonde with the long braid that enjoys teasing almost as much as she does… Frey… or something else Norwegian. Jupiter placed her personal clipboard on the front table for a secretary to gather and compile and reached for her schedule book for the day. “Two meetings down… looks like I’m free until dinner,” she said to no one in particular – herself, really, as the room was quite empty. “I wonder what the others are up to? Probably trying to lay low – the feast and ball last night was insane,” she continued, murmuring to herself at a level barely above a whisper. Yesterday had been the start of the Semiannual Summit, a conference wherein representatives of every major territory not usually in attendance at court came to Crystal Tokyo to catch the capital up on the current events around the world. It was exciting to see such collaboration between so many different cultures, but after the two-week long series of meetings and events, a break from the multitude of people balanced out the feeling of loss when they all went home. Such meetings were getting easier, especially with genius Mercury working with her team on teleportation units. Jupiter smiled – what a girl! Doctor/surgeon turned scientist-relativistic physicist! 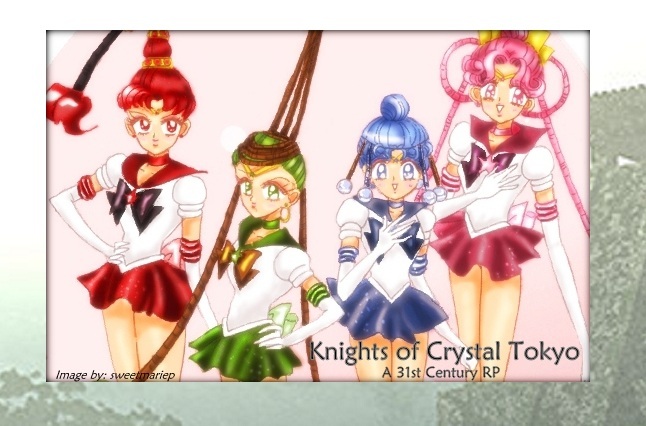 After completing her medicinal doctorate and practicing and perfecting the art for years, she took an interest in Eternal Sailor Moon’s tale of how she, Sailor Kakyuu and the Salor Starlights flew through space to Sagittarius Zero Star in much less time than it took for light to travel the same distance. Since then, she, Sailor Pluto, and even King Endymion (on occasion) would hold long theoretical talks about dimension bending – or something like that. Mercury was still in love with helping people and curing illnesses, but there weren’t many challenges in medicine anymore, especially after she opened her University of Medicine (which has been pumping out savvy doctors and miraculous cures ever since it opened, helped in its research by the new flora and fauna being categorized from all corners of the earth). Mercury and Pluto were probably at it now, joined by other great minds that were invited to the Summit for the very subject under study. Perhaps Mars would be free and willing to do something? As Secretary of War she shouldn’t have too many meetings, not with the current political atmosphere, anyway. Jupiter pulled out her communicator and had her finger hovering over the “contact” button when she heard someone calling her name. Io Castle? She hadn’t visited there since the Silver Millennium when Queen Serenity gifted it to her at her birth, as the Queen had done with all of the guardian scouts. Why was she needed? Was there a problem? “Go!” was the immediate response as Mars’ voice echoed through the device. In a wash of lightning and roses, Eternal Sailor Jupiter took a deep breath and willed herself home, to Io Castle on Jupiter. When she opened her eyes she found herself in a white marbled hall, green veins of malachite winding their way through the soft ivory stone. Plants were everywhere, their vines hanging from baskets and their flowers perfuming the air with smells so light and luscious Sailor Jupiter could not help but breathe deeply and smile. As she let out that first breath, a miniature version of herself appeared. She opened her hands for her Guardian to stand upon. There was a great noise from a corridor off of the main hallway, and the guardian turned and grasped the tips of Sailor Jupiter’s cupped fingers. She followed the guardian’s gaze just as a short dark-blonde boy spilled out into the courtroom of Io Castle. He appeared to be a young teenager, probably between 13 and 15 years old, judging by his build. The lad had literally spilled out of the hallway, landing on his backside facing away from her. “You’re gonna regret that!” the blonde proclaimed heatedly as he bounced back up off the floor. “Really? And who’s going to make me? Surely not a shrimp like you,” a much taller teenager declared, stepped out into the hall with his hands planted firmly on his hips. ‘What is going on?’Sailor Jupiter wondered. “Boys!” Jupiter Guardian yelled sharply, calling their attention. The tall brown-haired boy looked up and immediately dropped down into a kneeling position, the hand opposite his raised knee in a fist on the floor to support his weight. The smaller blond boy was slower to turn, but dropped just as quickly into the exact same position when he caught sight of them. They were joined quickly by two others who emerged from the corridor. “Princess Jupiter!” said one of the boys who had recently emerged. He had black hair, but that was just about all she could tell about him from this angle. Thinking quickly, Sailor Jupiter briskly walked towards them, stopping about ten feet away, and said “Thank you. Please, rise,” a phrase she had heard Neo-Queen Serenity use on several occasions. The boys did as she requested. All four, though different in build and appearance, were wearing outfits so similar they could only be uniforms. Each had a half-cape stemming from clasps set on their shoulders and were adorned with metallic plated chest armor, gauntlets on forearm and shin, and a belt fastened with ornate, different colored disks. All in all, the effect was similar to what Endymion had worn as a prince in the Silver Millennium… there was no way… Sailor Jupiter found herself smiling. These boys looked so serious right now! The face of the boy with black hair was downright solemn, his gray eyes boring into hers as if he had the world on his shoulders and only she had the power to take it off. The differences in their outfits was mainly in color, with each of them representing a different hue – the dirty-blonde, orange-red; the brunette, a deep emerald green; the third boy, with blue eyes and platinum-blonde hair, a shade of turquoise blue; the black haired boy, dark purple. “Princess, we are your top soldiers, the Primary Four!” the black-haired boy proclaimed, saluting her by placing his hand over his heart and performing a half-bow. The others quickly did the same, the short blonde boy last. “My top soldiers, eh?” Jupiter questioned, “you look a little young…” she was only teasing, but that short one took the bait. “YOUNG?! WHO ARE YOU CALLING YOUNG? !” he challenged, his red eyes blazing as he promptly stepped forward, only to be dragged back by the blue-eyed one of the bunch. “Princess, we were reborn only a short time ago, I apologize for our current appearance, and for Io’s outburst,” the black haired boy requested, still in a perfect salute. “YOU SHUT UP!” Io growled, straining against the hold of the third boy in an attempt to reach his mocker. “Enough boys, enough!” Sailor Jupiter laughed. The name Io cinched it – she had had an inkling about their identity before, with their number and her involvement, but there was little doubt in her mind now. These boys must be the guardians of the four giant moons of Jupiter – the Galilean moons, as they had been referred to on Earth. That they were boys while the moons were named after mostly females was semi-amusing, but then, her planet was named after the most promiscuous and powerful male god of them all, so given titles were nothing to judge someone on. At her command, the boys straightened immediately, returning to a salute (Io as well, though grudgingly this time). “Princess Jupiter, these are the guardians of—“ Jupiter Guardian began, but she nodded her head and interrupted. -err.. or a good guesser…. From what she knew about the makeup of the moons, she took a stab at their identities. “Thank you, Europa,” she guessed; by the look on his face, she was right – Europa was bright and icy, similar to his hair and eyes. The tallest must be Ganymede, as it was the biggest moon, which meant the black-haired apparent leader was Callisto, which made sense as the moon was covered in fine black sand. That was the only warning Sailor Jupiter had before Ganymede charged her. Tossing Jupiter guardian upwards for safety, she sidestepped the charge, caught his outstretched hand and kneed the boy in the stomach, using what was left of his momentum to flip him onto his back. It had happened in a fraction of a second and she was quite impressed with her reaction time, especially so long after she had had to use it; the boys were apparently impressed as well. “What?” she asked, now completely confused. Was this what Jupiter Guardian had called her for? Sailor Jupiter reeled under the inflow of new information about the past – she had had her own guardians? She didn’t remember any guardians… but then, the memories of her past life were fuzzy and hazy up until she took up full-time residence in the Moon Kingdom and met her friends. It was possible that these four (an older version of those four? Io seemed to think he should be much older…) were who they claimed to be. “How much do you remember about the Silver Millennium?” she asked. “Yeah, I would have never guessed we were related, otherwise,” Ganymede said, having picked himself up off the floor. Related? … now that she really looked at him, their hair shade was just a few degrees off, their eyes similar colors… heck, she had acted just as he had on a few occasions before she had met Usagi back in the 20th century… But she had had an older cousin? She looked to Jupiter Guardian, who floated back down to eye level and simply nodded in affirmation. “To go back with you to Earth!” Io exclaimed, “I bet there’s still tons of evil down there! I would love to test my mettle against anything you can throw at me!” he drew his thin rapier from its sheath, and (after mumbling something under his breath), flame erupted down its length. ‘tons of evil down there,’ huh? Was he making a pass at their abilities? Sailor Jupiter put a hand on her hip and tilted her head to the side with a half smile on her face. “Um… er, not to infer that the place is overrun with turmoil…” Io sheepishly corrected, the fire slowly extinguishing itself. She thought for a long moment. What would Serenity say? ... she’d probably welcome them with open arms. And training? She and Mars were already training the Sailor Quartet once a week, what’s another four students? And these seemed to have powers based in the elemental – unlike the quartet, whose powers they were still trying to predict and understand… As for their need to fight evil, after training with us, we could intern them out to other solar systems – Princess Kakyuu and the Starlights had started a program to foster planets out whose scouts had yet to be reborn since the fight with Galaxia, so she’d probably have a place for them to settle down almost immediately. Io dropped his sword as he turned to high-five Europa, and Calliso looked to be so full of appreciation it was as if he had had serious doubts that she would accept their request. Training these boys wouldn’t be so bad – Endymion might even take some time with them, and that would be fun, wouldn’t it? Jupiter stood behind the line of boys who knelt reverently before Neo Queen Serenity. They were in the official reception room in the palace of Crystal Tokyo, representatives and administrators stood to either side of the large isle, all eyes on the four new Knights in front of them. On the dais at the front of the room, bathed in pure morning sunlight that filtered down from the crystalline ceiling above, Neo Queen Serenity and King Endymion sat on tall thrones of crystal, flanked to the left by Eternal Sailors Mercury, Mars, Saturn and Pluto, to the right by Venus, Uranus, Neptune and Small Lady Serenity. Off the dais and to the left stood the Sailor Quartet, Sailors Vesta, Pallas, Juno and Ceres, two of whom were involved in a quiet disagreement (that stopped immediately when they felt her eyes on them, the two perpetrators now looking sheepish). It had been little less than a day since they had arrived from Io Castle, and after introductions and a short meeting of the Sailor Scouts (even the outer scouts showed up – Uranus was only too happy to have more guardians-in-training. She and Neptune had been disappearing frequently on missions to extra-solar worlds to help out with Princess Kakyuu’s efforts, and often mentioned the need for the sailor crystals to be reborn on those forsaken planets), during which her earlier plans for the boys had been agreed upon, they decided to make the boys’ presence in the capital official. “Do you swear to use your powers only for good, to protect truth, justice, and the innocents?” Sailor Jupiter asked, her voice echoing through the silent room. “We do so swear,” the boys promised as one. “We do!” The boys had been quite taken with Neo-Queen Serenity – they had all prostrated themselves before her when they were first introduced. Apparently, Princess Jupiter was only a princess, but Queen Serenity was the queen. Jupiter smiled – she didn’t mind in the least. Serenity was an amazing woman, and this wasn’t the first time people found themselves in awe of her. Serenity did look pleased, as did Endymion. Venus pumped her arm in a cheer for the aptly named ‘Knights, her smile shining brightly. Mercury, Mars and Neptune clapped politely, Pluto and Saturn nodded at them in greeting, Uranus smiled a challenge towards them (… maybe she would wait a while before training them against Uranus… the outer scout tended to go for the ‘sink or swim and sweat as you try’ method), while Small Lady smiled – was she blushing? Chibi-Usa was blushing! The boys were cute – Jupiter wondered who the pink-haired little lady had her eyes on. A discussion would be had with Venus later, Jupiter planned mischievously.